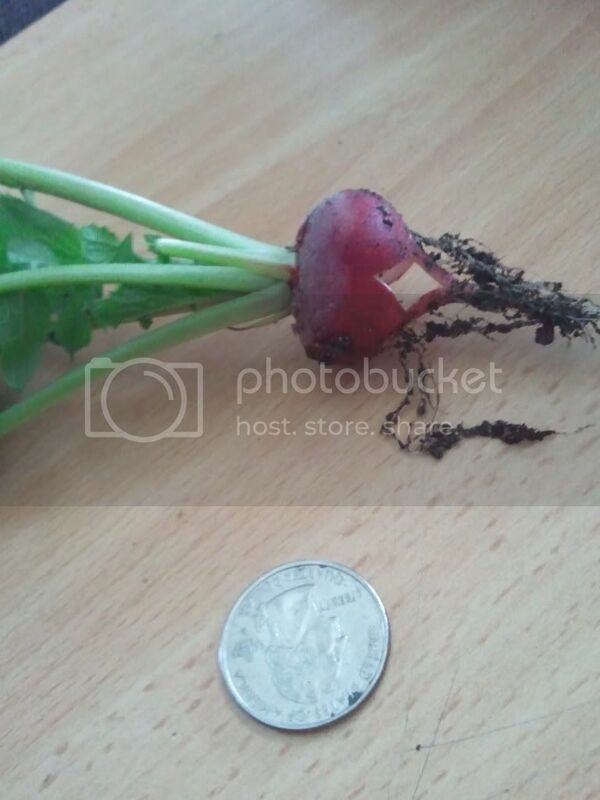 Today I just couldn't helped my self and collected a radish, its the only thing that looks ripped out of anything i have planted, its pretty small but ama make every bit worth it, the bottom looks a bit weird is this normal? its split. Sometimes radishes will split. I think it may be due to getting a bit too dry then getting watered. Enjoy your crop! I may be wrong, but it looks like it tore open when harvested. It had a definite crease but not split. See the box shape. I love that feeling- Congrats on the first radish! One more week will make a big difference in size with a radish! I plan on planting radish everywhere this year all kinds! I have several flat coming up now! in the greenhouse! Thanks for the nice picture! DoubleDogFarm wrote: I may be wrong, but it looks like it tore open when harvested. It had a definite crease but not split. See the box shape. Interesting thought, Eric. But is it not due to the conditions Jal -ut suggested - sudden moisture change with added tuggage from compacted soil? Nice radish. Like Bobber said, leave it a little longer and it will get much bigger. I leave some of mine for a long time they get bigger. Radish are really easy to grow IMO. I am orderin tomorrow fromHPS shrumway a 1/4 pound of french Breakfast radish for $3.95 plus some other things. The french breakfast radish is red with a white tip on the botton and is long like a small stubby carrot nad taste great when young! Agway sells seeds in bulk also. I want to try the radish in early april for a three week cover crop then dig it under! Just going by what I see. To me, it looks like a obvious hinge. Also most root crops that split callus over. Look at the picture, clean fresh tear. Congrats on the radish. The beginning of something bigger.